Well, long in the tooth is an understatement here lately. Judging, not so much by our friends and patrons, from whom we still get the occasional kudos for our website, but by the mellifluous and subtly patronizing emails we receive in the dozens per week from all those fans from far away lands that so generously offer their expertise, time and energy, for a small fee of course, to pointing out how beautiful and effective our website is while at the same time, in the kindest manner, how crappy, how antiquated, how 1999 it is. Like Lloyd Christmas we're tired of our website eking it's way through life, we want to see it flourish and grow. So we've been working on the new site for the last year. All of the text has been pored over, some of it rewritten by our resident wordsmith. Some of the principle photography, no idea what that means but it sounds good, has been re-shot, and the entire look and structure of the site has been properly coded. We used real code this time finagled by a real person who has put in a lot of time bolstered and fueled by uncountable Jack's pepperoni pizzas. So thanks to the crew at Benchcrafted that allowed me to finally upgrade to Windows 10 for fear that ditching Windows 7 would have rendered my copy of Dreamweaver 4 inoperable, the most shocking bit being that the copyright on the splash screen is 1997-2000!. So yes, I guess we have been coding like it's 1999. I hope I never again have to code a single line or think about cascading somebody's style sheet, or render a layer and convert it to a table. And in the vein of getting current........just like Signor Roberto we would like to say "the rent stay lika before!" but unfortunately it can't. We only really raised prices 1 time in 10 years! There have been a couple small adjustments in those years but the current M series Tail Vise is only $10 more than it was 6 years ago or more, and that was an off the shelf handwheel not the current custom cast unit. The Glide M is only $100 more than it was 6 years ago, again with an off the shelf wheel........but it now includes a Crisscross which is $100 so it hasn't actually risen in price at all, and that after adding a custom wheel and 3x knobs. Mag-bloks have only gone up $3 & $5 respectively.......ever! So expect some increases in the next few weeks across the board mostly. We had wanted to get the increases in before we launched the new site but it will just have to happen in spurts sometime between now and January. Don't get too worrisome though, the increases for the most part will be small. Launch should be Friday Dec. 1. Next up: the blog is getting a face lift too, but that won't happen for a few more days yet. We have for sale a freshly-built-to-spec example of our Classic Workbench. 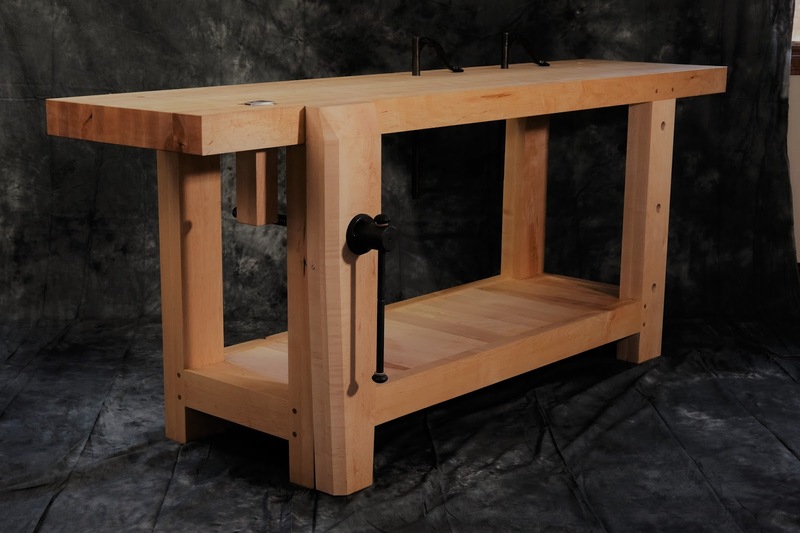 Made entirely of hard rock maple, it's outfitted with our Classic Leg Vise w/Crisscross, Planing Stop and one Hand-forged Holdfast, For full specs and photos, see our Classic Workbench Plans page. This bench is built exactly to the specs listed. The bench is in the white, that is, we didn't apply any finish to any of the surfaces. You can either leave it that way or apply a finish of your choice (we hope you leave the top unfinished, or at most one coat of oil.) The bench is completely assembled and ready to use. The Benchcrafted Classic Workbench is constructed entirely with in-compression-for-eternity drawbored mortise and tenon. It's as solid as humans can make it, short of growing a tree in the shape of a bench. The bench is built to the highest standards of traditional German craftsmanship in the utopian village of Amana Iowa. Our collaboration with the craftsmen in Amana, along with our experience in traditional workholding has yielded a workbench that is truly heirloom quality, but offered at what we think is a very reasonable price. There are other bench makers out there who are offering stunning museum-quality, marquetry-encrusted benches with our hardware and designs (Frank Strazza and Mark Hicks among others.) We consider our flagship Split-Top Roubo as nearing the pinnacle of bench design (if there is such a thing) but we wanted to offer an essential bench built to high standards--an approachable but bulletproof tool for passionate enthusiasts that are perhaps just getting into the craft. Our principle bench maker has been building furniture at the Amana Furniture Shop for nearly 50 years. Needless to say, 150 years of woodworking tradition in Amana directly back to 19th century Germany speaks for itself. Many of the Amana craftsmen are multi-generational woodworkers. The bench is available for pickup in eastern Iowa (contact us for details) or white glove delivery, in which the bench is wrapped in moving blankets, transported in a moving van used for furniture delivery only, then unloaded at your address and brought inside by the delivery techs. It costs a bit more to ship this way, but less than you might imagine. Price is $2600. Delivery fees extra. Delivery typically takes about 2 weeks. If you're opening a school, community shop, woodworking club or refitting an existing facility with worn out or poor quality benches, please contact us, we can supply you.